‘Angel Wings’ is an Australian hybrid looking mostly like a microphylla. 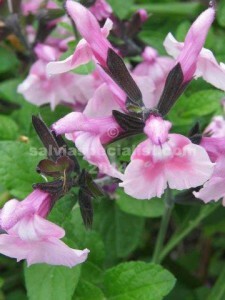 It is a particularly good performer with masses of two tone pink flowers from spring to winter. Height and width is approximately 80cm. Probably sun is best. Frost and drought hardy. Pruning: It could be sheared off to the ground, half way, or some stems only cut out to the ground progressively. The latter will give you a tidier plant for the longest flowering. You should not be able to easily kill an established plant by pruning. Almost out of this popular plant, only one per order please.